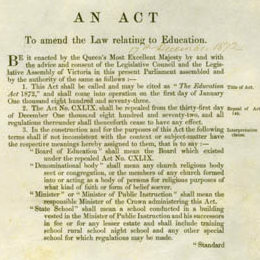 This law set up in Victoria the basis for a uniquely centralised model of school education, unlike those in Britain, the United States or Canada. Victoria was the first of the Australian colonies to set up a central public school system based on the principles of free, secular and compulsory education. In the second half of the 19th century the Australian colonies assumed direct responsibility for education from the churches, local groups and private providers. Until then, these private organisations had supplemented the inadequate public schools. The creation of the new government schools came as the result of protracted argument and absorbed substantial public resources. The new system was based on principles of secular, compulsory and free education. Religion was a source of conflict to be avoided in the new government school system, so government schools were to be secular with no teaching of religion. Schooling was compulsory and children were required to attend school both because literacy and numeracy were a way to the common good, and because educated citizens were essential to self-government. Education was free, because it served the public benefit. This Act and subsequent Education Acts created large, centralised education departments that had close control over classroom practice. The needs of the state took precedence over parents, and these public schools drilled their charges with the knowledge and capacities that would equip them for citizenship. Macintyre, Stuart, A Colonial Liberalism: The Life and Times of Three Victorian Visionaries, Oxford University Press, Melbourne, 1991. Detail from the title page of the Education Act 1872 (Vic). 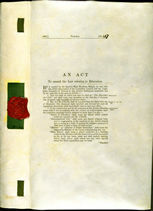 Features: Bound with a green ribbon which is stamped with the red seal of the Parliament. The last page is signed by the Governor and the Clerk of Parliamen.